Heath pearlwort, an overlooked jewel? This ground-hugging plant with tiny white flowers, about 5mm across, was photographed on 23rd May 2017 by Chris Cant from Cumbria on a cliff-top promontory south of the Old Man of Stoer (NC0134). It is heath pearlwort Sagina subulata, one of a group of relatives of chickweeds, stitchworts and mouse-ears. 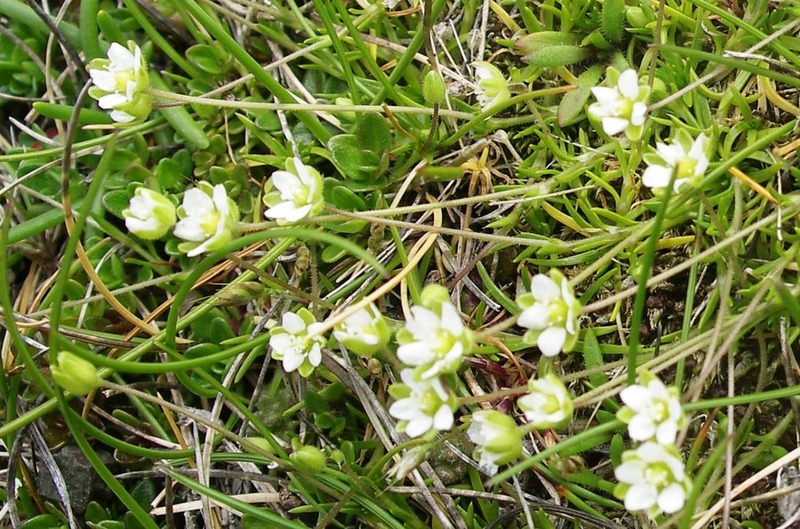 Six species of pearlwort have been recorded in Assynt; they are generally rather inconspicuous, and the presence of two of them has only been confirmed relatively recently. Heath pearlwort is distinguished by its star-like flowers, which have five petals about as long as the sepals and are borne singly on long stalks. Confirmation of its identity is provided by the presence of sticky hairs on the back of the sepals and long, sharp points to the fleshy leaves, both of which show in parts of this photograph. It is usually found in open, sandy or gravelly ground, and most of the few local records are from the coast running from Achmelvich to the Point of Stoer. This clump was well-spotted and provides only the second local record during the current century.